When I was browsing eBay a month ago, a found an auction with Aidetek Box-All Cases. As it was an auction, I managed to get two for the price of one. 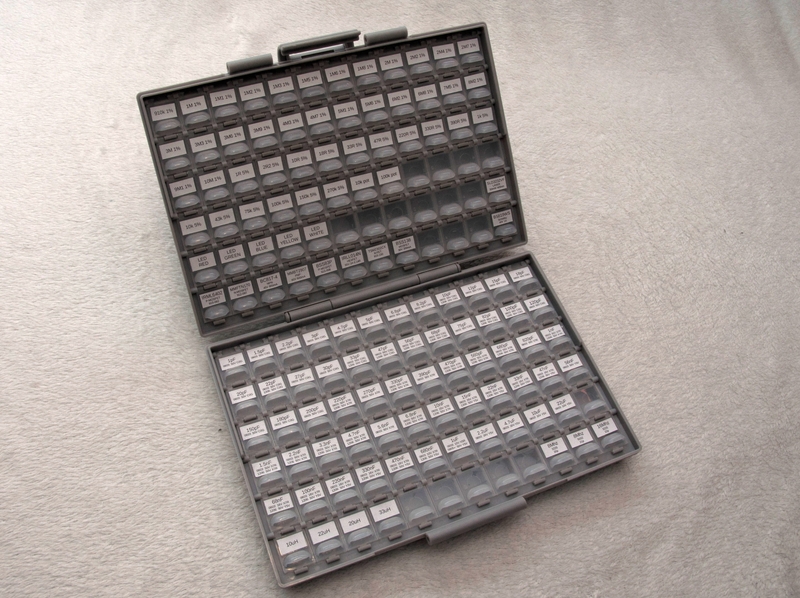 They provide 144 compartments with dimensions roughly 18×16×10 mm, so they are suitable only for smaller components. 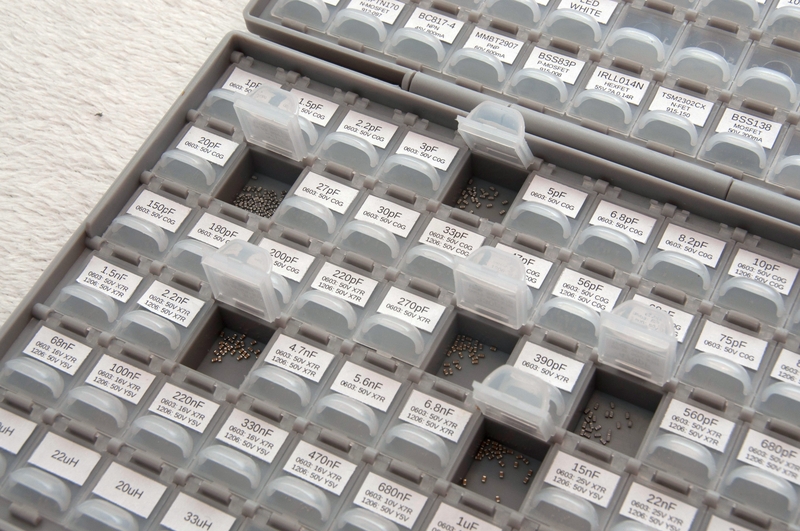 These boxes are designed to store bare SMD components without any packing – the lid contains a small rim, which does no allow even 0201 package to fall out. I really like it – it’s reasonably small, with a sufficient number of compartments and it look stylish. Everything looks durable and I am not afraid it will break during time or an accidental fall. Only downside is that the lid takes quite a lot of force to open – it could go smoother. Event the boxes are nice, if they are used in the same way as I used the business card manager, they become a chaos in a while as new types of components need to be added. 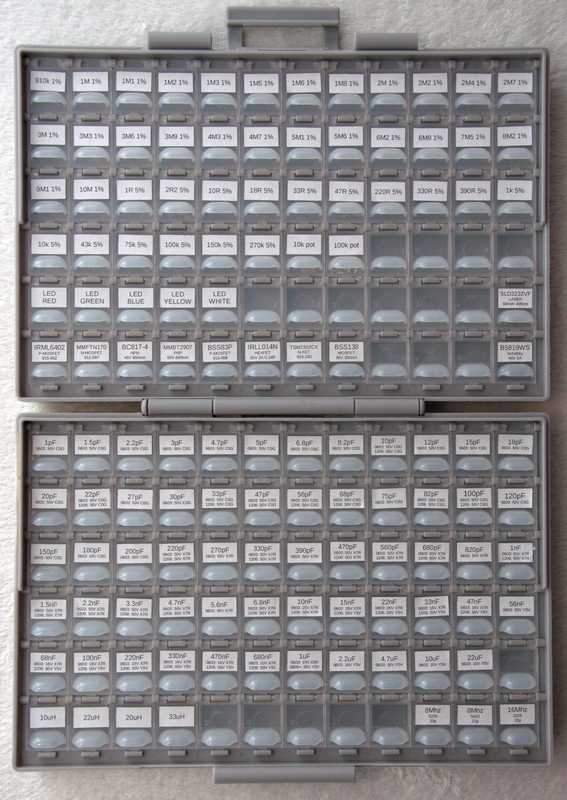 So I make a decision – I use these boxes only for SMD resistor and capacitors (larger components doesn’t fit) and I pre-fill it with a reasonable amount of values. 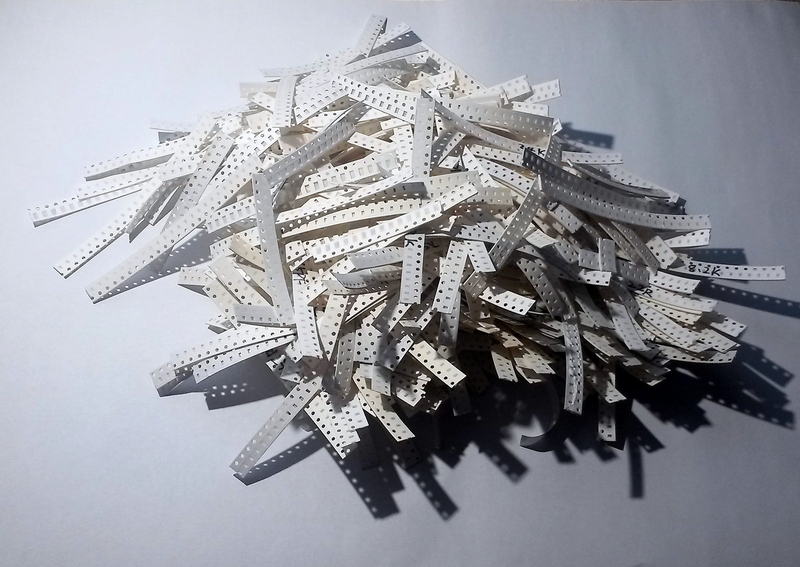 So I bought a set of 177 values of resistors and 50 values of ceramic capacitors (50 pieces of each value can be found for about $15 on-line). I also decided to drop 5% resistors and use only 1% – I only make small series, so the price difference is negligible and I can use such a resistor practically anywhere. Everything is in 0603 packages, as I practically don’t use any other in my projects. 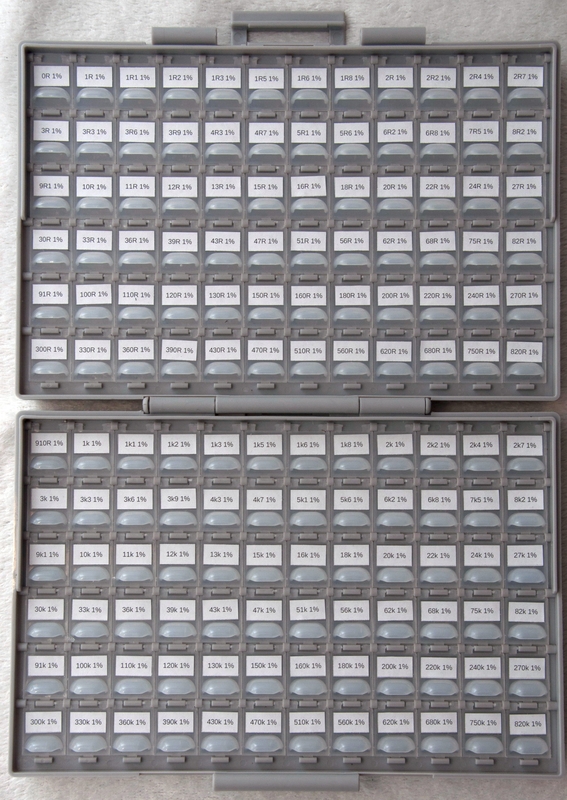 Only several selected values of resistors I have in 1206 packages and I store them together with 0603 in one compartment, because the packages are easily distinguishable and the compartments are a precious commodity. The filling with label printing took me few hours to complete. Now I understand, why pre-filled boxes are so expensive. It is a terrible, monotonous work. If you value your time, eyes and figers, buy a pre-filled one. After I found Box-All, I started looking for another boxes I can use for storing my another parts. There are many boxes, or cases available, however all of them look cheap and impractical. Also, if you buy a case with compartments, you have to plan what to store where in advance, and changing the layout later is hard. 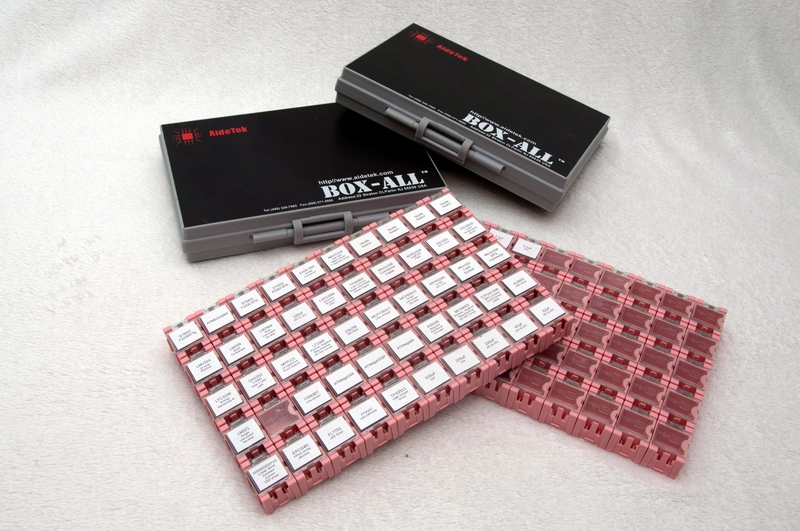 However the WenTai Boxes amazed me instantly – each compartment is an individual unit, which can be attached to other unit to form a uniform block – what a glorious idea! The boxes can be rearranged any time you want. They also make a lot of colors and different sizes. I decided to go with 100 of the smallest compartments, which can be found on-line for about $20. 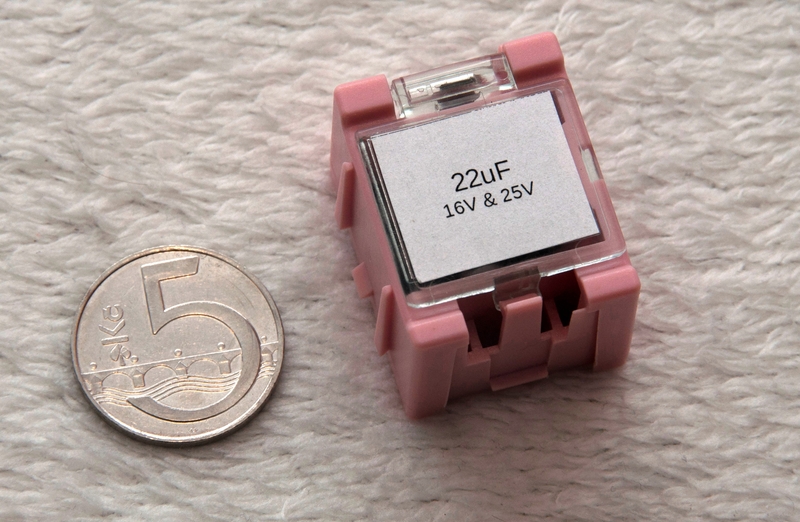 The smallest compartment inner dimensions are roughly 25×31×22 mm. Large enough for many of my other components, I thought. But the actual space is smaller, because of a bit inside the compartment, which hide the attachment clip. 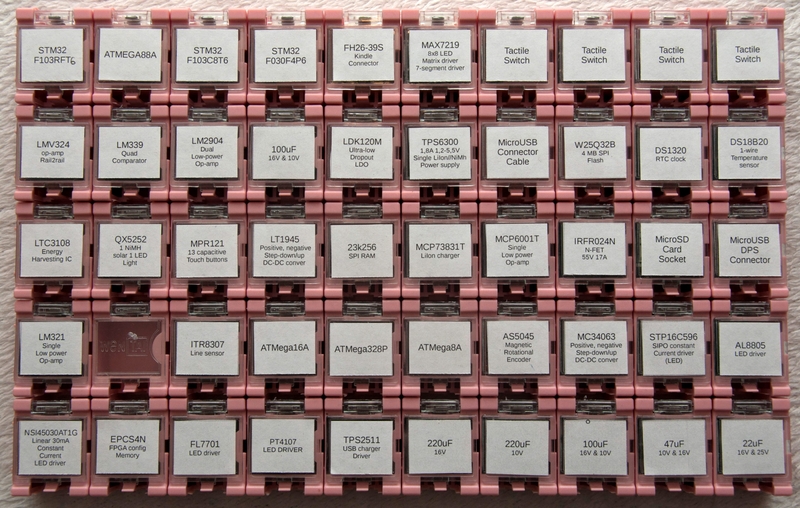 Even though, you can fit in there even 10 microSD card sockets or 25 SMD electrolytic caps. However DIP16 for example won’t fit just because of the bit. The compartments has a transparent lid with no handle – it opens using a spring if you press a small plastic hook. This is nice, as the block of compartments is smooth on top and you can lay several layer over each other. The lid does not have a rim and there is a 0.3 mm space between the lid and the body of the compartment when the lid is closed, so you cant store extremely small packages without another packing, because they fall out. The attachment mechanism is robust and easy to handle, when you get used to it. You have to force a column first and than you can attach columns of compartments to each other. These boxes are available in many colors, however the seller send me the probably ugliest one. This is the first of my two disappointment from these boxes. The second disappointment is the bit inside the box, which takes up the valuable space. I’ve been using these boxes for two weeks and already made several boards using it. 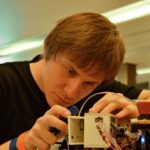 I am excited – finally looking for components is a matter of seconds. No messing around with plastic boxes, no worries about mixing components together. And also these boxes, especially the one from Aidetek, are easily transportable. 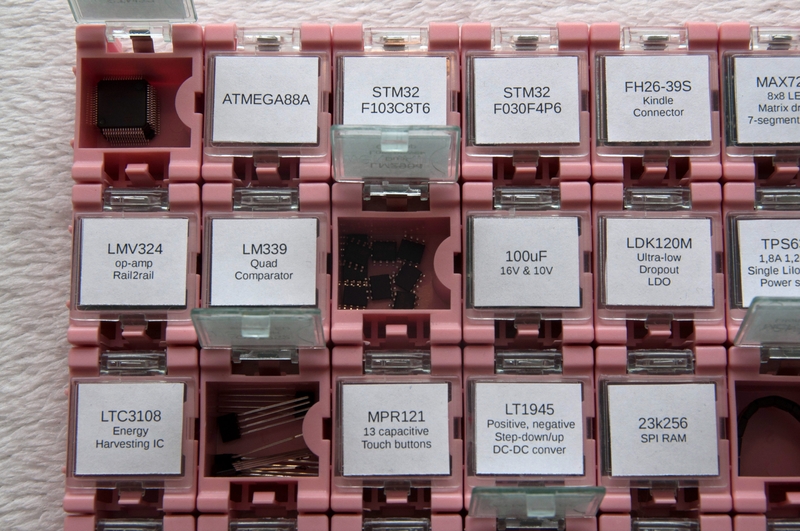 I am glad I bought and started to using these boxes to organize my SMD collection. 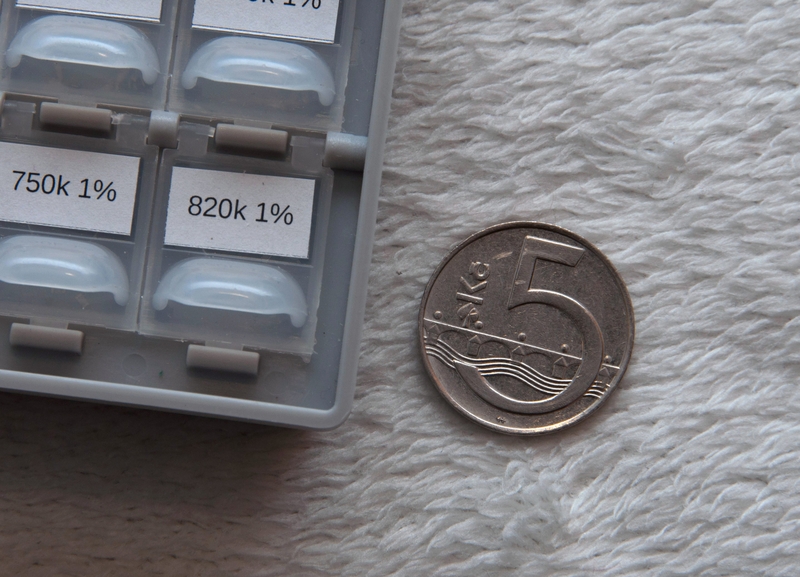 I am also thinking about buying the other sizes of WenTai boxes, however I am currently quite discouraged with their high price. 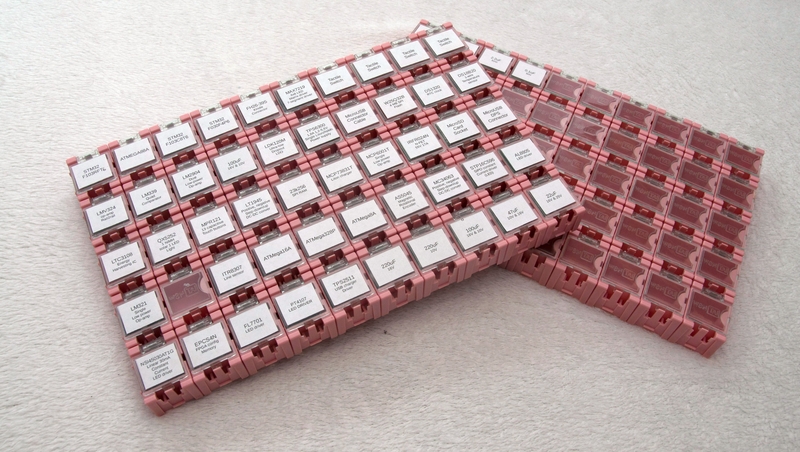 144 compartment boxes are bad – had stuff spill out numerous times, better get one sided ones, with 128 compartments. 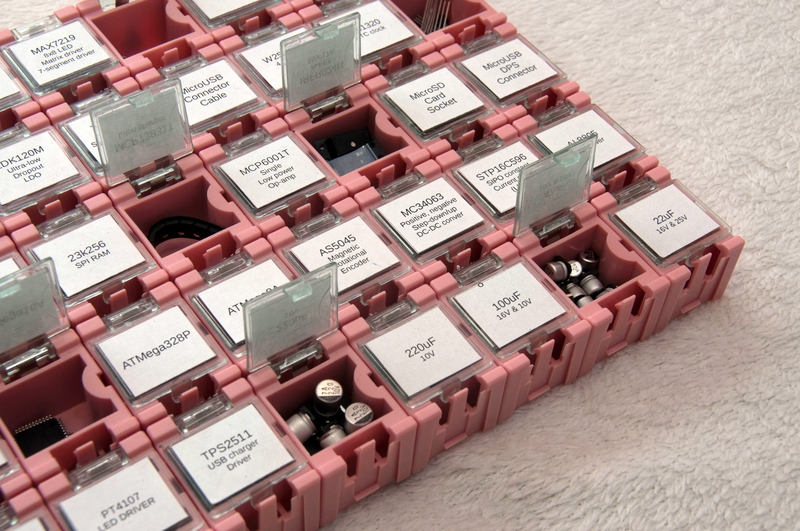 Regarding single boxes – look into Licefa SMD storage boxes, now those ARE quality, you can get those on Farnell. Really? I have a great experiences with the 144 compartment boxes and I haven’t managed to spill a compartment yet. I have seen the Licefera and I think they are just slightly better than the Aidatek. And of course – the WenTai boxes are rubbish compared to Licefera, but I like the possibility to arrange in whatever configuration I like.